An anterior cruciate ligament, or back cruciate ligament injury is a tear in one of the knee ligaments where the femur connects to the lower leg bone. The anterior cruciate ligament is crucial for stability of the knee. Injuries of this kind range from mild, such as small tear, to serious, e.g., as when the ligament snaps, or when the band and part of the bone is completely separated from the rest of the bone. Without treatment, the injured anterior cruciate ligament is less able to control knee movement and the bone surfaces are more likely to rub against each other causing increased pain and discomfort.Sometimes other knee ligaments or parts of the knee are also injured. These include cartilage as the menisci in the knee joint or bone can become worn out and if not also treated can lead to osteoarthritis. 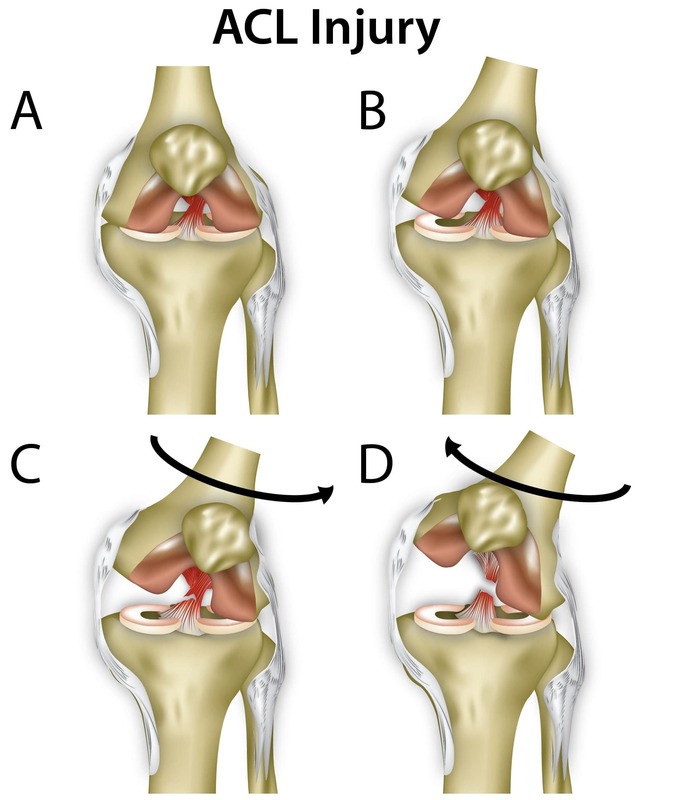 Grade I – a mild injury that causes only microscopic tears in the ACL. Although these small tears may stretch the ligament, they have no influence on the overall ability of the knee to support the individual’s weight. Grade II – A moderate injury whereby the ACL is partially torn.The knee may be slightly unstable and may periodically affect the way in which the individual when stands or walks. Grade III – A severe injury in which the ACL is completely torn through and the knee feels very unstable with increased pain when walking or standing. Overall, most ACL injuries are severe Grade IIIs, with only 10% to 30% being either Grade I or II. Currently approximately 100,000 to 250,000 people per year in Europe are affected by ACL injuries. Although many of these injuries occur during sporting activities (especially contact sports), over 60% occur with no direct contact with another player. Your anterior cruciate ligament can be injured if your knee is bent backwards, is twisted or bent sideways at an awkward angle. The likelihood of this injury is higher when more than one of these movements occurs at the same time. Contact (taken from another person or object) also can cause an anterior cruciate ligament injury. Sudden stops, turn, pivot or changes in direction at the knee – these movements are an integral part of football, basketball, rugby, gymnastics and skiing.For this reason, athletes who participate in these sports are at particularly high risk of ACL tears. Extreme hyperextension of the knee – sometimes during athletic jumps and landings, the knee is extended more than it should be beyond its normal range of motion resulting in a torn ACL. This type of ACL injury often occurs because of a misjudged jump in gymnastics or an awkward landing in basketball. Direct contact – The ACL can be injured during sports, usually during direct impact on the outside of the knee or lower leg.Examples are a sideways tackle to the knee, an errant kick that strikes the knee or a sliding tackle in football. Feeling or hearing pop in the knee at the time of injury. Pain on the outside and knee. The knee swelling within the first few hours after injury. This may be a sign of bleeding inside the knee joint. Swelling that occurs suddenly is usually a sign of a serious knee injury. Limited knee movement because of the pain or swelling, or both. After an acute injury, you will probably have to stop whatever activity you are doing because of the pain, but you may still be able to walk very carefully or with support. A doctor can tell if a person has an anterior cruciate ligament tear, by examining the knee and asking certain medical questions about your prior knee health. The doctor may ask: How did you hurt your knee? Have you had any other knee injuries? Your doctor will check for the stability, movement, and tenderness in both injured and uninjured knee. You may need X-rays, which can show damage to the knee bone. Or you may need other imaging tests such as an MRI. An MRI can show damage to ligaments, tendons, muscles, and knee cartilage. Arthroscopy can also be done to achieve this aim. During the arthroscopy, the doctor uses surgical instruments through one or more small incisions (cuts) in the knee on the inside of the knee to see better the extent of the damage to the knee ligaments. Start first aid immediately – Employ important first aid tips to reduce swelling and pain. Use the RICE method. The letters stand for resting the knee, putting ice on it to alleviate any swelling, use an elastic bandage for gentle compression of the knees, and finally keeping the leg elevated for better blood circulation. It is also important at first to move the leg as little as possible. Taking over-the-counter pain relievers can help to reduce some discomfort. You may need to go with crutches and a knee immobilizer for the first few days after the injury. Your knees should be checked by your doctor. It is important to seek treatment. If you do not, the injury can become a long-term problem. There are two ways to aid the treatment of ACL injuries: exercises and rehabilitation. It takes several months of rehabilitation for the knee affected to get better. Surgery is also an alternative if the ACL injury is Grade III. Having an operation can provide long term stability and control of the knee again although rehabilitation will take several months also. Treatment is usually dependent on how much of the anterior cruciate ligament is torn, whether other parts of the knee hurt, how active you are, your age, your overall health, and how long the injury has occurred. Make the knee stable when, or at least make it stable enough to perform daily activities. Reduce the chance that your knee ligaments become more damaged. The best way to prevent anterior cruciate ligament injuries is to stretch and strengthen the leg and knee muscles, especially the front and back thigh muscles (and the thigh muscles).